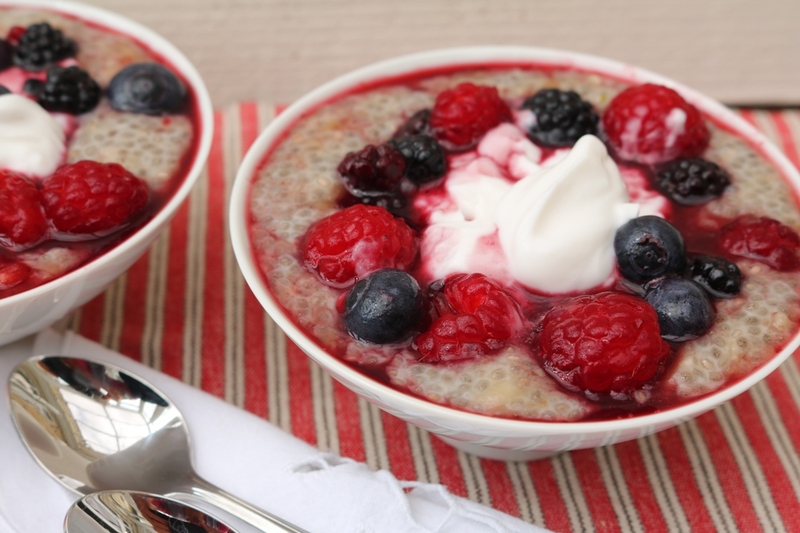 Soak chia seeds overnight for an easy but decadent breakfast treat. High in anti-inflammatory omega 3’s, chia seeds are full of fibre to keep you satisfied for hours. They are also useful for mid-morning or mid-afternoon snacks. The mixture will keep for 2-3 days in the fridge – just dip in whenever you need sustenance or store in little pots ready to take with you when you are on the go. Place the chia seeds and milk in a bowl and whisk to combine. Whisk occasionally over the next 10 minutes until the chia seeds have thickened – this prevents lumps from forming. Mix in the honey and vanilla extract, then place the soaked chia seeds in the fridge to chill and soften for 3-5 hours or preferably overnight. Mash the banana until smooth, then add to the soaked chia seeds. Divide the mixture between two bowls (or pots if transporting) and top with the fresh fruit, yogurt or coconut cream just before serving. Chocolate Chia Seed Pots: Follow the recipe above but add half a tablespoon of cacao, cocoa or carob powder to the mixture along with the honey and vanilla extract. Top with sliced pear, dairy-free yogurt of coconut cream and some toasted coconut flakes.